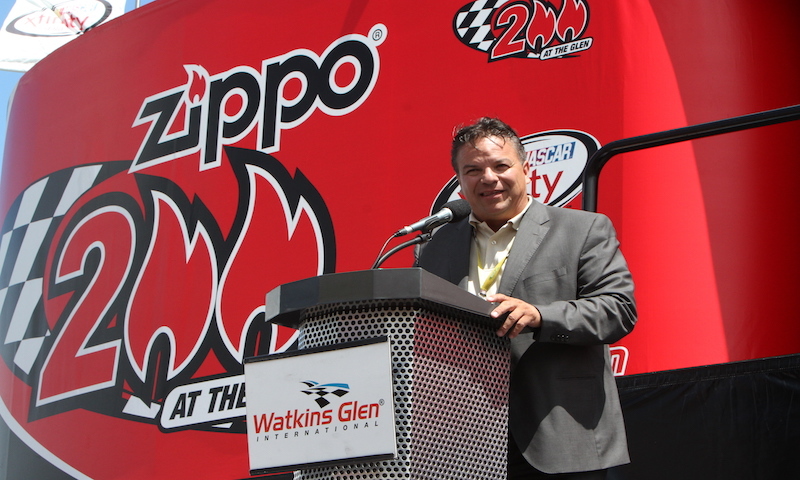 WATKINS GLEN, N.Y. — Michael Printup has served International Speedway Corporation for just over 17 years: at Michigan Int’l Speedway twice, as a lobbyist in Staten Island and more recently at Watkins Glen Int’l as track president. Printup recently sat down with Race Chaser Online to preview this weekend’s NASCAR activities and answered questions that always seem to surface when NASCAR rolls into town. Race Chaser Online: How long have you been with WGI and what brought you to “The Glen” or attracted your career to working here? Michael Printup: I’ve been with the company for just over 17 years; first at Michigan International Speedway, then as a lobbyist for the company in Staten Island when we were trying to build a NASCAR facility down there from 2004 to 2008. Then I went back to Michigan again for about a year and a half and then Watkins Glen opened up. I’m originally from this area in a town South of Buffalo in Hamburg, NY. My family is still there, so when I had the opportunity to move here it was a great opportunity. This is home, only two hours away from Hamburg. My wife and my two kids and I really enjoy it. Race Chaser Online: WGI has become wildly popular with the fanbase (two sell outs in a row, headed for a third); is there anything that you can put your finger on to say why? Michael Printup: I think it’s always a multitude of things coming together. First of all it’s evolution. You have to stay on your toes in the promotional business. We have the best team in motorsports (here at WGI). We change, we move, we keep things that work. We’re not afraid to take chances. But it’s also the history and popularity of Watkins Glen as this is our 69th year racing in ‘The Glen.’ It’s also the diversity of the schedule here as we have on-track activity every day during our season from opening day until we close. We also have the largest wine festival East of Napa, California which has been voted “Best Wine Festival” by USA Today two years ago. It’s also the investment of the company into our facility. We’ve invested $50Million into WGI in the last thirteen years to keep it growing and keep it up to speed. ISC continues to let us grow and prosper. Race Chaser Online: USA Today recently had a fan vote that declared WGI as the fan favorite track on the NASCAR circuit. That has to go a long way with your staff that work so hard to help build and continue this momentum and success? Michael Printup: We’re so lucky to have great fan and media support because without the fans we wouldn’t be here. This is the second time that we’ve won that award in a row from the fans. We don’t have as large a following as say a Daytona or Richmond or Phoenix, but our fanbase is so adamant at keeping us at the top. I couldn’t be more proud to have the best fanbase in the sport as well as the best team in the world working here.